Two Concorde jets take off from Lod Airport in Israel for a U.N. conference that will finally bring peace to the Middle East. Covered by F-14 fighters and accompanied by security men, the planes carry warriors, pacifist, enemies, dignitaries - and a bomb! Forced to crash-land, the men and women of the peace mission make a desperate life or death stand against Palestinian commandos. 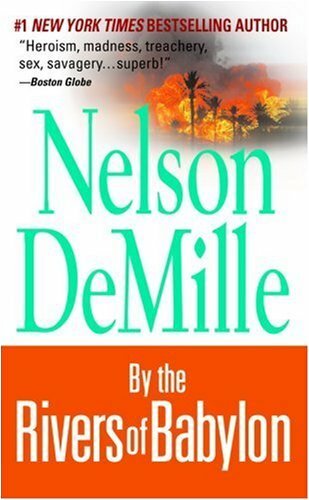 Nelson Demille's "By the Rivers of Babylon" is a military thriller from the late 1970's. The basic premise involves an Israeli peace delegation flying to New York on two Concordes, only to be hijacked by Palestinian terrorists. When they crash land on the ancient site of Babylon, the small group of men and women, with only a handful of weapons, but a strategic defensive advantage, makes a stand against a superior force. Aside from some of the obvious dating due to historical changes during the past twenty-five years, this book works surprisingly well. Of course, a plane load of Israelis crashing in Iraq during the past few years would have met a different fate. Several things make this story work: The first is the pacing and orchestration of the action scenes. Demille proves adept and building action, juggling multiple sequences and moving us forward on this roller coaster ride. For example, when they first crash, they have only a small contingent of security men, but one happens to have an M-14 with a starlight scope, and he is able to become an effective sniper to hold off the initial advance. But the stakes are always high, and with each attack the defenders are pushed closer to the brink. Another thing that works is that the characters are strong enough to hold our interest. Most are not fully developed, but the two key players, Jacob Hausner and Miriam Bernstein, are dynamic and create an emotional core. Hausner is the head of El Al airline security who must deal with his own sense of failure, internal power struggles, and desire to eradicate his nemesis, Ahmed Rish. Rish, the leader of the terrorists, is the brilliant but insane leader of the Palestinians. Miriam Bernstein is one of the leaders of the Peace Delegation, who undergoes significant changes in her relationships and viewpoints on the peace process. Along the way, there are various heroes who rise to the occasion, such as the pilot, David Becker, the intelligence man, Isaac Burg, the American operative, McClure, General Dobkin, F-14 pilot Teddy Laskov and a host of others. DeMille became one of my favorite authors with just one book, The Gold Goast, and oddly enough, that book is quite a bit different from the main genre of the rest of his work which tends to be more military/police/spy type thrillers. After reading several of his recent books, I finally got a chance to go back many years and read this one. I'll get my one main complaint out of the way, it's the fact that the book has a plethora of characters and I wasn't ever really sure who I was rooting for specifically. As it turns out, the protagonist if you will, is probably the group as a whole, they banded together and survived as a group (even though some of the characters were lost). I guess I can accept that, although I prefer the strong male leads that dominate all the subsequent works by DeMille that I've read. Even though written nearly three decades ago, not much has changed in world politics and this novel could probably take place in reality tomorrow with only a few minor changes. I often wonder if world security forces go through fiction, after all, Tom Clancy wrote about a pilot flying a jet plane into the White House and later when it was tried for real, everyone acted like "nobody could have ever imagined that". In any case, this book and DeMille's The Lions Game, both have airplanes being terrorized in different and unique ways, I hope someone is taking notice. As for the why I give this book a strong recommendation, and why I'm sticking with five stars in spite of my complaint, it's a page turner, fast paced and well written, it has military science, love, war, hate and a whole lot more. Not bad for a first effort. I've read subsequent novels by DeMille and he's improved. His dialogue, for example, is now much wittier. I was enthralled by the first half of the book, the set-up. It's a very intriguing situation. But the last half was too filled with clich¨¦d Hollywood cliffhanger (literally, at one point) melodramatic sequences. And the action became repetitious. During the last attack, the Israelis keep firing at the thirty Arabs who are attacking, even tho they are low on ammo. No mention is made of any hits. Why waste precious ammo if you're not hitting anyone? And if you are, the 30 Arabs would disappear pretty quickly. I think this is just sloppy action writing. In one way, DeMille acts at though he writing a H'wood script, in that the plot builds up to non-stop action with attempted hair-raising scenes. But in another way, he is much too verbose to be a script writer, since the descriptions in a script must be lean and mean. Here, DeMille seems to think you should never say in a sentence what can be said in a paragraph. And in a script, there can be no throw-away dialogue. THE PLOT Peace in the Middle East is almost assured and two concordes are flying to New York with delegates for the negotiations. Terrorists against the peace conference plant bombs on board and try to take them hostage. After destroying one plane and killing all on board, the plane is forced to land near Babylong but at the last minute manages to get the hostages to the top of a small hill which they attempt to defend against the hostages through several days of sorties, knowing that the military probably doesn't know where they are and therefore can't swoop in and rescue them. WHAT I LIKED Long before there was Clancy, there was De Mille. This book takes the international realm and stands it on its ear -- the relations between the characters on both sides of the peace conference who are forced to work together to fight the hostages are brought to the surface in excruciating detail. The battle tactics are first-rate, the writing is almost perfect, and the story is superb as the "hostages" fight in small groups with every weapon they have -- gas bombs from the plane's fuel tanks, sounds from a war movie blasted over speakers to simulate larger weaponry, etc. WHAT I DIDN'T LIKE The ending is a little over-the-top, resembling a scene from a Die Hard movie more than keeping with the slightly more realistic tone of the rest of the book. As well, there is a meeting between the hostage-leaders and the terrorist-leader that is absolutely surreal. The likelihood of both parties treating it like a military battle with truces, etc., is virtually nil but it was at least interesting. At the end, there was a lot less fewer characters left and that helped the plotting speed-up. Up until then, there were too many small sub-plots -- not all of which were necessary. Some were good, and necessary to flesh out the experience, but not all of them. Nelson Demille consistently surprises me with his research, knowledge and laser paced action in his books. He just has a way of drawing me in to his characters with their transitional dialouge. I want to know them, care about them, and of course despise horrific villains. And as for action adventures, well, let's just say he moves a plot around like a Chinese acrobat with an inner ear problem! In "By The Rivers of Babylon", we meet an extensive group of characters who begin a journey of peace for the Middleast. Two Concordes take off from Lod airport. A mysterious Lear jet invades their flying space. Not known to the pilots and passengers is the fact that a rebel Palestinian guerilla, Rish , has had bombs planted in the tails of each bird as they were being built a year before. Leading to an exciting kidnapping and forced landing. What I enjoyed the most in this compelling book were the strategies of war. How different eras as well as nations handled nightime invasions for example. And how one must do anything to survive--anything. This seemed to be a pre-cursor to "The Lions Game" by DeMille. Similar themes, however, I was intrigued with the setting of Babylon. The history involved, the colorful descriptions of the Euphrates river, how Mesopatamia had been a glorious city and it's ironic downfall. Highly recommended reading for the adventure lover. I am currently on page 245 out of 422 in this book and I already think that it is wonderful. Just recently have I discovered Nelson DeMille and this is the fourth one of his novels I'm reading. He writes wonderful thrillers and this is no exception. It begins with talks of a peace conference for the Israeli government in New York. But a terrorist has different ideas and hijacks the two Concordes on their way to New York and forces them to some ruins near the Tigris and Euphrates rivers in what was Babylon, once again placing Jews in Babylonian captivity. Now, this small band of politicians, delegates and a few security officers with mostly small handguns have to defend a hill(resembling Masada) against a highly trained group of heavily armed Arab terrorists. Since I'm not totally done with this book, I can't really say anything else about it. In fact, I don't even know why I'm writing this right now. I am at(what I think is) the beginning of the climatic scene and big battle. I suggest this book strongly and hope that you find it as thrilling as I am. Hard to believe it was a first novel. Superbly crafted with many fully developed characters (good and bad) filled with tense drama and unending suspense...and an ending with a satisfying resolution as not every good guy remains standing. Some suspension of disbelief may be necessary, but not a ton. In times of extreme duress against impossible odds (especially in battle) many times men have risen to incredible heights. It is this aspect of the human spirit that is central to "By The Rivers Of Babylon" and makes it so credible. It is the story peopled with unlikely heroes who surprise even themselves as they rise to the occasion. I was drawn to the protagonists and their indomital vitality under pressure. It was refreshing that all were flawed, but none beyond redemption. The villians were exceedingly well drawn and particularly abhorrent. A most exciting and fulfilling reading experience. Iraq, Iran, Palestine, the Middle East ... will the conflict ever end? Built around the interminable Arab/Israeli conflict in the Middle East, the plot is simply enough told. Two Concorde jets, packed with a small army of politicians, diplomats, security agents and a typical administrative entourage take off from Lod Airport in Israel. Their destination is a UN peace conference that many believe will lead to a final and lasting peace in the Middle East. But there are also some so filled with hatred that they will do almost anything to sabotage the conference and ensure that the wish for peace becomes a house of cards collapsing in a hail of bullets and blood. In a cunning plan that stretches out years in the planning, a team of terrorists blow up one of the jets and skyjack the other forcing it to land in the desert along the Euphrates River. "By the Rivers of Babylon" tells a thrilling tale of survival and the guerilla-like commando tactics of the heroic passengers of the Concorde as they struggle desperately against their attackers and attempt against all odds to reach the outside world with news of their plight in the Babylonian desert. In his first novel, DeMille makes grand statements about the nature of courage and heroism under fire, sacrifice, loyalty, altruism and love. He has crafted interesting characters such as Jacob Hausner, the security officer who cannot forgive himself for his careless oversight many years earlier that allowed the terrorists access to the Concorde's inner workings. We witness Miriam Bernstein, Golda Meir's young and beautiful hand-picked political prot¨¦g¨¦ evolve away from her roots as a far left wing advocate of peace at almost any cost. "By the Rivers of Babylon" is undoubtedly a page-turner but equally clearly it is an early work that simply doesn't measure up to his later thrillers and his ability to craft much, much deeper and more complex, multi-faceted characters such as John Corey and Kate Mayfield. Nor does the plot move along with the same speed and, by my measure, suffered from a certain repetitive sameness that would have been eliminated with some judicious editing to shorten the novel. But that said, the techno-thriller world would be a poorer place without the benefit of "By the Rivers of Babylon". Recommended. As timely today as when written 30 years ago. Demille's "By the Rivers of Babylon" is an excellent read even though its setting is more than 30 years ago. It is as germane to today's world as it was 30 years ago. It is a story of heroism, courage, evil, mendacity, love and savagery. Perhaps today we can better appreciate the savagery since our lives are now daily inundated with reminders of the same. The book could easily have been written yesterday save the sensibilities of the characters that have long since passed us by. In that regard, the book is a refreshing reminder of a world where sacrifice, honor, integrity and duty meant something more than mere words. And though that world was crumbling even then against the onslaught of modernity, on a hill on the rivers of Babylon 50 members of a peace delegation waylaid on their way to New York found themselves fighting for their lives against terrorist savages bent on their destruction. The dynamics between members of the peace delegation and the transformations that took place in order to survive have the ring of verisimilitude. This book is quite different from Demille's other offerings. I'm not sure I can directly compare it to any of his other books other than the quality of the writing and the grip it exerts on the reader from beginning to end. Number 1 On A Scale of 1 to 10!